Pardon my quote on rotting food, especially in the lead up to something so sweet but, it’s a quote that has partially shaped my overall philosophy on the foods I choose to eat and prepare for my loved ones. In the US we have rows upon rows of supermarket shelves dedicated to convenience food products like prepackaged cake mixes, as well as cake frostings. These tiny tubs of creamy frosting offer not only convenience, but perhaps also a euphoric nostalgia that you could bake a cake that looks and taste just like the cakes that grandma used to make. –And you can, even without the boxed cake mixes and store bought tubs of frosting. Beyond its appearance and taste it’s probably nothing like the cake and frosting of our childhood, especially when you realize that most store bought frostings are loaded ingredients like partially hydrogenated oil and high-fructose corn syrup. In fact, they are typically among the first ingredients listed on the packaging, meaning they comprise a majority of the ingredients within those frostings. Partially hydrogenated oils are added to products like store-bought frostings to increase shelf-life and make them less likely to spoil, unlike real butter, which has a very short lifespan if left unrefrigerated. However, what isn’t spoiling on our supermarket shelves can certainly spoil our bodies and health. Partially hydrogenated oils contain trans-fat. Trans fats increase our bad (LDL) cholesterol and decrease our good (HDL) cholesterol levels, thereby increasing our risk of hearth disease. As for high-fructose corn syrup, it’s true that sugar is sugar, and too much of any sugar is bad for us. But, just like fats, not all sugars are created equal. High-fructose corn syrup is in lots of products that line our market shelves that call on the need for sweeteners. Food manufacturers often use it as a sweetener, not only because it’s cheap, but it’s also used to increase shelf-life in food products. And despite what some might lead us to believe, it is in no way a natural sugar just because it’s made from corn. High-fructose corn syrup is extracted using chloralkai, which contains mercury. In a 2008 study, Renee Dufault, former Food & Drug Administration scientist, and her colleagues found trace amounts of mercury in food products containing high-fructose corn syrup. (*) And although these amounts are only trace amounts, over time these amounts can accumulate in our bodies. Frostings containing mercury or trans fats aren’t food products that I want to serve to friends or family. And since cake frosting is so easy to make, there’s no need. This is the cake frosting I used for my Strawberry-Lemonade Cupcakes I baked for my friend, Franzi, for her birthday cupcakes. The light pink color comes the use of real strawberries. And the creaminess comes from real butter. -Don’t even think about using margarine! 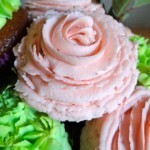 You can also make a raspberry buttercream, perhaps resulting in an even brighter pink color. Cornstarch helps firm and set the frosting, making it ideal for piping designs, especially in hot or humid weather. If you’re not in need of a frosting that sets or hardens slightly, simply omit the cornstarch. It’s easy to make, and you will never need to buy another store bought container again. Add the diced strawberries and 1 tablespoon of powdered sugar to a small bowl. Allow the strawberries to sit for 20 minutes, and then mash them with the tines of a fork to release all of their strawberry-sweetness as well as their ruby-colored juices. Then, strain the strawberries with a fine mesh strainer, discarding the seeds and skins. Set aside. Then, in a large mixing bowl, sift together the powdered sugar and cornstarch. Don’t skip this step, as it will ensure that your frosting whips up free of lumps. Next, add the butter and 3-4 tablespoons of the strawberry liquid. If your strawberries happened to yield more liquid, don’t be temped to add more. The addition of extra liquid might make the buttercream runny. Whip the ingredients with a hand mixer until smooth. Alternatively, you can beat the ingredients using a stand mixer fitted with the paddle attachment, making sure to start on low speed. Ice your cake or cupcakes as desired. The icing will harden after a few hours in the fridge. 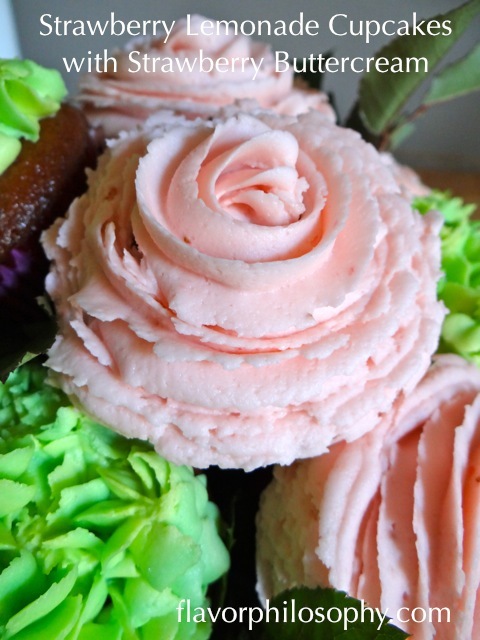 If you are looking to make the rose design, like the one on my Strawberry-Lemonade Cupcakes, place the icing into a piping bag fitted with a large star tip. Start in the center, and with even pressure ice the cupcake in a circular motion until you’ve reached the outer edge. If you are making this on an especially humid day, consider adding an additional tablespoon or so of cornstarch.